Like someone who's been found guilty of a crime they did not commit, the working class bemusedly finds itself in the state penitentiary waiting for further punishment to be doled out. While Cameron and Osborne chant the market mantra of the need to 'cut the budget deficit' they pick and choose where the axe will fall. Following the general election in May the Con-Lib pact was quickly brokered and Cameron/Osborne promptly announced £6.2bn 'efficiency savings' to 'reassure the markets'. Not so reassuring for the workers whose jobs were immediately under threat or whose welfare benefits were under scrutiny but the markets were temporarily appeased and UK Inc. kept its credit rating. And, just to show that the cuts were affecting everyone in equal measure, we had the announcement that the state retirement age is to go up to sixty-six for men by 2016 and for women by 2020. (By which time the already paltry state pension will be hardly worth thinking about.) Meanwhile, Cameron made no bones about the fact that this was just the beginning of the axe swinging. More draconian cuts would have to wait for the new Chancellor's forthcoming emergency budget in June. And so they did. On 22 June George Osborne hopelessly tried to salvage something of the Lib-Dems' relatively untarnished image by announcing a Budget that contained £11bn of cuts in welfare spending and a two year freeze on public sector wages for anyone earning above £21,000 per year as an 'unavoidable Budget' which 'is tough but it is fair'. Still invoking fear of losing the confidence of the markets as 'the greatest risk' to economic recovery Osborne insisted that all income groups would share the pain: 'When we say we are all in this together, we mean it'. - As, for example, in the case of VAT which he announced will go up from 17.5% to 20% next January. Since anyone who buys anything will have to pay 2.5% extra that's fair! Patently it's not fair, since 2.5% on any non-food purchases out of a weekly budget of someone on, say £21,000 per year has a remarkably more significant impact than, for example, someone on an average MP's salary. The same argument holds for universal welfare benefits which are being hit. For instance the freezing of Child Benefit for three years has a much harder impact on families who depend on it for the day to day upkeep of their kids than for the better off who simply regard it as a rather pleasant windfall to be saved up for the future. However, when it comes to cutting welfare payments the freeze on Child Benefit was dwarfed by Osborne's unveiling of a whole panoply of measures which have both immediately reduced or withdrawn financial support for existing claimants and at the same time have made it more difficult to claim benefits in the first place. In fact many people who have been entitled to claim a long term welfare payment are finding that the terms have been changed so that they suddenly no longer qualify or else they have to undergo a new, more rigorous, set of interviews and tests to qualify for what they have already been receiving - as in the case of Disability Living Allowance where existing claimants have now to face new medical tests. Families where the wage earner's income is so low that they have hitherto qualified for some kind of income support are now finding that support is disappearing. Three million unemployed and low paid workers in rented accommodation are finding their housing benefit payments are being reduced and an estimated 900,000 people are set to lose it completely. So it continues. Such a programme of cuts is a blatant attack on the poorest and most needy members of society. It is an attack designed to intensify as the measures take hold over the next few years and it highlights how the post-Second World War welfare state is being dismantled under the impact of the capitalist crisis. 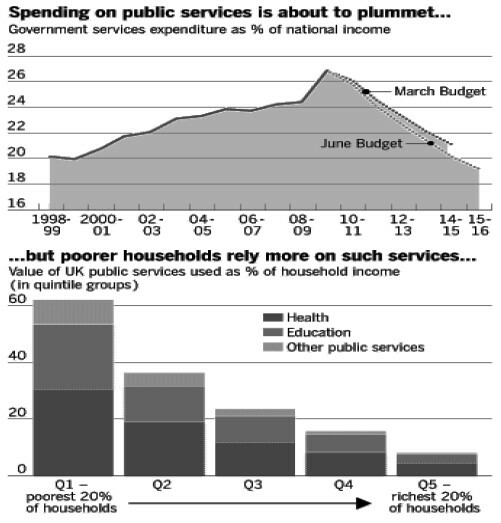 Although it does not take an official report to confirm what's happening, it is testimony to the extent of the onslaught on the standard of living of the working class as a whole (which is in effect what this means) that the Institute of Fiscal Studies should describe the budget measures as 'the longest, deepest, sustained period of cuts to public services spending at least since World War Two'. This was in July. In August, as Osborne got carried away with his own propaganda about the fairness of the cuts and repeated his Budget speech argument about "The richest paying the most and the vulnerable protected", the IFS response was simply that this is "not true". An indication of how far this absurd claim is false comes from yet another venerable body in the service of capital. According to a study of inequality by the OECD for the year 2000, public services represented 62 per cent of disposable income in for the poorest fifth of households in the UK but 8 per cent for the top fifth of households. (1) Ten years on that gulf can only have widened. This is certainly the sort of measure approved by the 'markets' which at the same time as demanding a reduction in the state's debt, contemplate a return to the same kind of speculative activity, much of it based on property, that led to capitalism's biggest-ever financial crisis and in the UK to an officially acknowledged £850bn capital injection by the state for the banks. (2) Whilst the aftermath of the financial crisis is still far from over - an unknown quantity of bad debts and financial losses have yet to be brought onto balance sheets - the 'markets', we are told, will bring down all kinds of disasters from higher interest rates to a collapse of sterling and the stock market, if state spending is not drastically reduced. Like a vengeful god demanding never-ending sacrifices to atone for some great act of communal wickedness, the 'markets' are the spur for Cameron and Osborne to go on to plan even more draconian cuts. ...the confidence of international investors should support sterling. This does depend on the government's ability to cut the public sector: Saying is one thing but doing it is another. The strikes and protests we have seen on the continent …can be expected in the UK and if the government's will falters, the market will react (3). Caught between the Scylla of the markets and the Charybdis of potential mass protests, Cameron and his side-kicks are carefully preparing the groundwork for implementing the cuts. They are still playing on the 'we are all in this together' theme, even to the point of sending crusading minions round the regions, 'consulting' locals about where the cuts should be made. This kind of propaganda ploy is unlikely to work for much longer as the harsh reality of what the cuts really involve sinks in. Beyond the propaganda, ruthless calculations on how to get rid of staff are being made at the same time as stealth cuts in the regions are introduced. The health service, for example, is supposed to be ring-fenced from cuts and we have had ministers' assurances that 'no frontline service will be touched' yet there cannot be anyone in the land who has not heard of a reduction in local hospital beds, never mind the fact that admin jobs have already been lost and civil servants in the regions have already had their wages cut. Even more ominous, though, are the government's attempts to reduce the amount of compensation 500,000 civil servants would be entitled to in the event of compulsory redundancy. (Instead of 6½ years' pay the government wants to make it a maximum of 2 years.) If the government's cuts are fully implemented 600,000 civil servants will lose their jobs over the next three years. This is on top of the already existing pay freeze and cuts in pensions. From the point of view of the Treasury official with a cost-cutting brief reducing the redundancy pay out bill beforehand makes sound economic sense. It remains to be seen how long the 'we're all in this together' nonsense goes unchallenged by workers once the phoney war is over and the full meaning of the mantra of 'reducing the budget deficit' is brought home to them. There was a time when the capitalists' general worldview of how to manage their system's crisis was circumscribed by the lessons they had imbibed from the 1930s: no return to trade wars and competitive devaluations; fiscal stimulus rather than spending cuts in order to avoid a re-run of the Great Depression. Even today's Con-Dems are not totally blind to the danger of further economic stagnation without some sort of state support. Vince Cable, the coalition's business secretary professes to believe in 'industrial activism' by which he indicates tax relief and limited state funding for research and specific new industrial projects. Nothing, in other words, on a par with an economy-wide kind of New Deal via deficit financing. Moreover, despite the growing reports of market fears of a 'double dip recession' due to the spending cuts and the recent focus on Ed Balls' call for the state to create more jobs in order to avoid a repeat of the Thirties, there is no real prospect for anyone facing redundancy than the vague homily that the private sector will take up the slack. Even if the Office of National Statistics is right and the British economy grew by 1.1% in the second quarter of this year - the fastest rate for four years - this is not going to redress the damage to livelihoods that is in store. It doesn't take much of an expert to see that in an economy where well over a quarter of jobs are directly in the public sector (8.5 million out of 31 million) with hundreds of thousands more dependent on state subsidies or government outsourcing (construction, for example, which has recently lost 215,000 jobs with the slashing of the new school buildings programme) there is not much scope for the private sector to replace the 600,000 jobs set to go in the public sphere. If it is the case that the latest official figures show a decline in unemployment (up to May) the fact is that the unemployment rate is still well up on 2008 (see chart). Moreover, the fact that the jobless rate is not massively higher is due to the unprecedented number of part-time jobs (7.82 million according to the Office of National Statistics). It's as if the likes of Cameron, Osborne and Cable had not heard of the 'jobless recovery'. Or maybe they expect the only sector where there is significant growth - banking and financial services - to plug the jobs gap. In any case, all the signs are that the financial parasites will continue to be allowed full scope for innovative wealth creation from whatever assets they can get their hands on. (For instance it has just been announced that Cameron has recruited HSBC boss Stephen Green to be trade minister. Green is a well-known opponent of splitting off investment from retail banking. So there goes another of the Lib-Dems pre-election proposals for protecting the savings of the 'man in the street'). There is not even going to be the pretence of a Dodd-Frank bill (4) from the Cameron crew. And if the markets are worried about how consumer spending and house prices will pick up in such austere times they will always find another means of making money from speculation - such as over the price of wheat. Meanwhile the Con-Dems will continue with their programme of attacking the working class and reducing living standards, up to and including items like winter fuel payments to the elderly which they adamantly pledged to maintain and protect during the election campaign. The sooner each of us realises that we really are in this together - the working class that is - the sooner an effective resistance can be raised. The situation is dire. It affects us all and will not go away. This latest manifestion of the capitalist crisis shows once again that capitalism is a system that is not sustainable. In a world rich in material wealth it cannot guarantee the continued wellbeing of its citizens. It is not fit for purpose and needs to be overthrown and replaced. Mass protests against the present cuts could be a start, but only if they lead to a groundswell of resistance independent of the framework of the trades unions and existing organisations which are designed to act as safety valves for the system rather than real weapons of resistance. In any event, there are signs that the present crisis is leading to a reawakening of class consciousness as the gap between capitalist ideology and the real conditions of life widens dramatically. Word has it that marxist discussion circles are 'springing up like mushrooms'. Not bad after all the talk about the death of communism and the end of history! (1) See article by Daniel Pimlott in Financial Times 25.8.10. (2) According to the National Audit Office. See for example, report in the Independent by Andrew Grice, 4.12.09 which goes into details. (3) Graham Shore (managing director of Shore Capital Group, an investment bank and fund manager), commenting on the Budget, 3.7.10. (4) Legislation passed in the US Congress in July 2010 which is supposed to tighten up regulation over the financial sector. Most commentators believe it will do no such thing but it is certainly the most ambitious attempt to regulate banking since 1934.